A group of seamen poses for a group photograph. Feedback includes comments about eyeglasses, Prince Felix zu Salm-Salm and an announcement about fundraising for Confederate Memorial Hall in Louisiana. 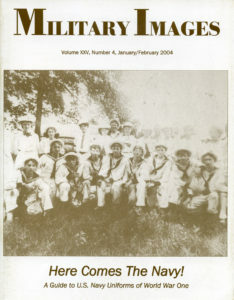 Five publications are listed, including Gettysburg (Houghton Mifflin) by Stephen W. Sears, The U.S. Army of World War I (Osprey Publishing) by Mark R. Henry, Civil War Heavy Explosive Ordnance: A Guide to Large Artillery Projectiles, Torpedoes and Mines (University of North Texas Press) by Jack Bell, Lone Star Confederate, A Gallant and Good Soldier of the Fifth Texas Infantry (Texas A&M University Press) edited by George Skoch and Mark W. Perkins and With Blood & Fire, Life Behind Union Lines in Middle Tennessee, 1863-65 (Burd Street Press) by Michael R. Bradley. A sampling of sales from the popular auction site Be.hold is included. The U.S. sea services of World War I essentially worse the uniforms of today’s navy, notes the author, who presents an analysis of navy, Maine Corps and Coast Guard dress. A total of 16 portraits and three insignia charts are included. Identified photographs include Yeoman Naoma Parsons and Seaman Carl “Chick” Bahm. Capt. Robert “Bob” Alston of John Hunt Morgan’s Cavalry was described by famed diarist Mary Chestnut as, “A brilliant creature, truly no doubt a fair specimen of the western daredevils who rally around John Morgan.” Another writer noted, “If Bob Alston is a prisoner, the Yankees won’t keep him long. He has a pleasant way of making himself so intolerable they will long to get rid of him.” The author tells the story of the colorful Alston, which is illustrated with the captain’s portrait and one of John Hunt Morgan. The author notes, “More than 200 young men served the Union cause during the Civil War in a little-known organization, the U.S. Army Medical Cadet Corps.” Its number incudes the subject of this profile, George H. Bosley. His life and military service is detailed here, illustrated with three portrait photographs taken before and during his service in the Civil War. William L. Carter served in the Mexican War and the Civil War. In the latter conflict he was an officer in the 38th Indiana Infantry. Severely wounded at the Battle of Jonesboro, Ga., on Sept. 1, 1864, he resigned due to disability before the end of the war. He lived until 1898. The text is illustrated with two portraits of Carter. The regiment was so large, notes the author, that a new regiment was created from its extra members. A history of the oversized regiment includes two outdoor images from the Library of Congress collections and portraits of two privates in Company M, William H. Shaver and Ezra Hawley Shew. The Union Volunteer Refreshment Saloon in Philadelphia, Pa., is the subject of this story. It is illustrated with a carte de visite and a pair of engravings of the popular destination, and a period advertisement. Herbert Young Rowland, a South Carolina-born farmer, served in Company A of the 13th Mississippi Infantry during the Civil War. Captured in Knoxville, Tenn., on Nov. 29, 1863, he spent the rest of the war as a prisoner. He lived into the 20th century. John Ravell, a native of Ohio, served as an officer in the Union navy during the Civil War. He was a member of the crew of the gunboats Fairplay and Moose. He barely survived the war, dying in 1867. His story is illustrated with his portrait plus portraits of Asst. Surg. Nicholas H. McGuire and Rear Adm. David D. Porter. Three outdoor photographs from the National Archives are also included. The author tells the story of how he came to purchase four cased soldier images at an auction in Topeka, Kan. Turns out the photographs, which were described by one attendee as “just commons” because the subjects were not pictured with guns or knives, were Confederates. One man, a lieutenant colonel, was unidentified. The other three however, were Capt. James M. Johnson and Lt. American F. Johnson of Phillipps’ Legion and Pvt. Nathaniel M. Calder Sr. of the 7th Georgia Infantry. Calder was a founder of the Georgia city of Marietta. 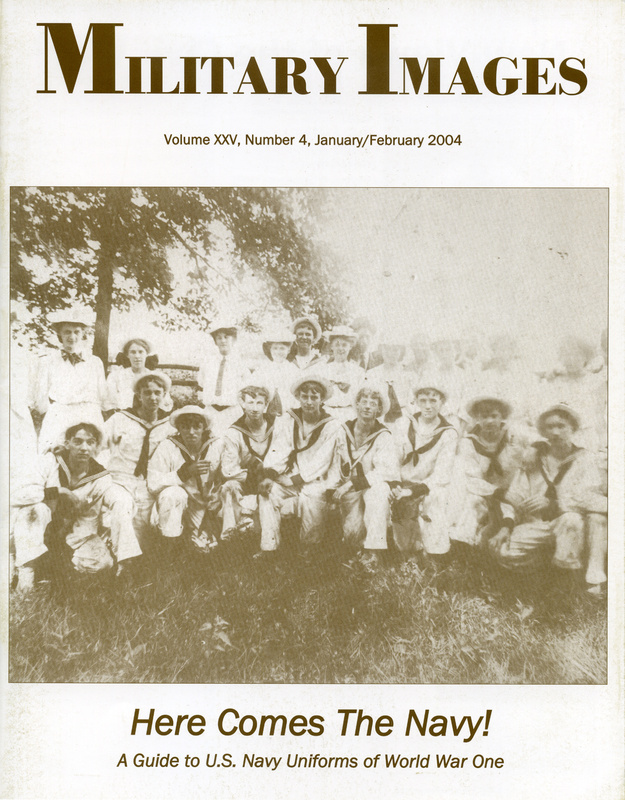 A trio of post-Civil War photographs is described here. Capt. Henry Julius Smith of the Gist Riflemen of Hampton’s Legion Infantry is profiled here. He was killed in action near the Dunker Church at the Battle of Antietam. His carte de visite illustrates the text. William J. Cornwell joined the 10th New York Heavy Artillery in the summer of 1862 and died of disease in the autumn of 1863. His carte de visite illustrates the text. A sixth-plate daguerreotype from the Kean Wilcox collection pictures an antebellum militiaman who served in the Massachusetts Volunteer Artillery.